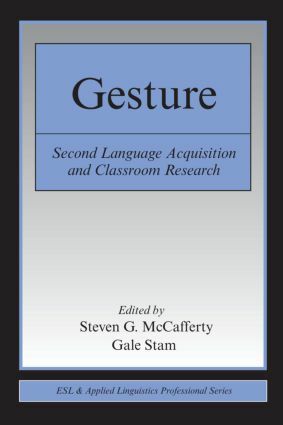 This book demonstrates the vital connection between language and gesture, and why it is critical for research on second language acquisition to take into account the full spectrum of communicative phenomena. The study of gesture in applied linguistics is just beginning to come of age. This edited volume, the first of its kind, covers a broad range of concerns that are central to the field of SLA. The chapters focus on a variety of second-language contexts, including adult classroom and naturalistic learners, and represent learners from a variety of language and cultural backgrounds. Part I, Gesture and its L2 Applications, provides both an overview of gesture studies and a review of the L2 gesture research. Part II, Gesture and Making Meaning in the L2, offers three studies that all take an explicitly sociocultural view of the role of gesture in SLA. Part III, Gesture and Communication in the L2, focuses on the use and comprehension of gesture as an aspect of communication. Part IV, Gesture and Linguistic Structure in the L2, addresses the relationship between gesture and the acquisition of linguistic features, and how gesture relates to proficiency. Part V, Gesture and the L2 Classroom, considers teachers’ gestures, students’ gestures, and how students’ interpret teachers’ gestures. Although there is a large body of research on gesture across a number of disciplines including anthropology, communications, psychology, sociology, and child development, to date there has been comparatively little investigation of gesture within applied linguistics. This volume provides readers unfamiliar with L2 gesture studies with a powerful new lens with which to view many aspects of language in use, language learning, and language teaching. Does Gesture Aid Discourse Comprehension in the L2?